NEW PRAGUE, MN (October 26, 2006) - New Prague natives The O'Neill Brothers have been nominated for an Emmy® award for their TPT (Twin Cities Public Television) special, "The O'Neill Brothers: Piano for Someone You Love." The program, which aired on Twin Cities Public Television and in other Midwestern markets late in 2005, was nominated for best Arts/Entertainment Program Feature/Segment/Special by the Upper Midwest Chapter of the National Television Academy. 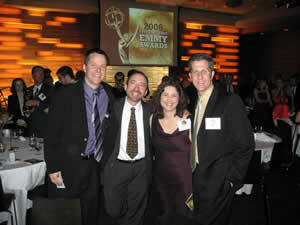 Tim and Ryan attended the 2006 Upper Midwest Emmy Awards ceremony on Saturday, October 21, at the Graves/601 Hotel in Minneapolis. The multi-million-selling siblings recorded the concert program with their group of talented musicians and a special guest, singer/songwriter Deborah Gibson, who exploded onto the pop music scene at age 16 with the #1 hits "Only In My Dreams" and "Lost In Your Eyes." The program included fan favorites from the brothers' library of CDs, as they performed on two grand pianos. "The O'Neill Brothers: Piano for Someone You Love" special is set to be rebroadcast on TPT during its December 2006 pledge drive. The program was produced by Melissa Jones, directed by Theresa Meyer, and executive produced by David S. Preston. This holiday season, The O'Neill Brothers will headline a special concert for Twin Cities Habitat for Humanity at Orchestra Hall in Minneapolis. And now through December 31, 2007, the brothers will donate $1 from the sale of every copy of their newest holiday CD, Holiday Home, to the organization. The duo will also perform a holiday concert in New Prague on November 29, 2006.